Radio talk show host and conservative commentator Rush Limbaugh is now at war with RNC Chairman Michael Steele. This is a fight that Steele can't win. Barack Obama first brought up Rush Limbaugh in a conversation a couple weeks into his presidency. I thought he had made a mistake -- essentially elevating a talk-show host as a leader of the opposition. Now, it's looking like a stroke of genius. Rush then mocked those who have criticized him for saying he wants Obama to fail, and directly challenged them to choose: You either want Obama to succeed or fail at his goal of dismantling conservatism. “So send those fundraising requests out,” Rush said in a sneering tone, in an apparent reference to Steele, adding: “Make sure you say, `We want Obama to succeed.’ So people understand your compassion. The president and his aides have kept the Limbaugh carrot dangled out there for all this time. Finally, Steele (and South Carolina Gov. Mark Sanford and Rep. Eric Cantor to a lesser extent) bit on it. Result: There's now an open civil war between the organizational structure of the Republican Party and the man who commands the allegiance of millions of its conservative base. He may not like it, but Michael Steelewas forced to eat crow real fast. Steele and the RNC knew they couldn't win this fight. It's the modern-day equivalent of Mark Twain's great quote: "Never pick a fight with someone who buys ink by the barrel." 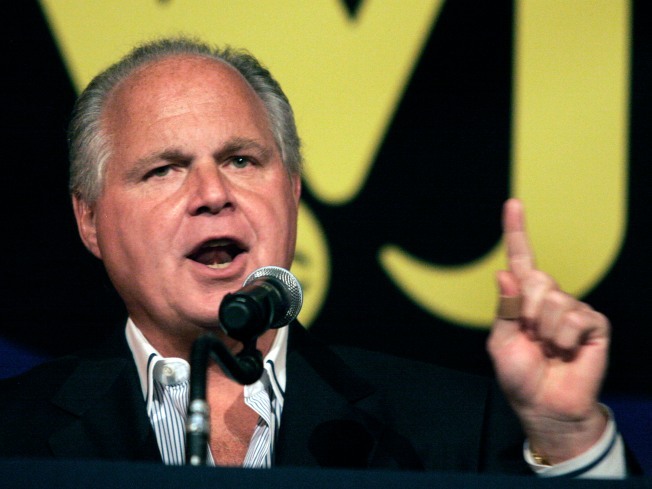 Rush Limbaugh doesn't need the Republican National Committee. The people who listen to Rush are, however, many of the same people who send $25, $50 and $100 checks to the RNC. A disgruntled Limbaugh has the power to dry up Committee coffers for some time. The several thousand attendees of CPAC last weekend reveled in the red meat that Limbaugh was serving up. Rightly or wrongly, he is a hero to them -- one who speaks truth to power. Calling his rhetoric ugly was a big-time fumble for Steele. So now, at a moment when a beaten-down right needs all the unity it can muster -- against a Democratic congressional majority that can conceivably just roll over it -- its party organization and a significant figure of its base are dealing with some bruised feelings (ya think a quickie apology will let Rush forget this?). The swiftness of the apology even allows the Democrats to keep up the charge that Steele and the GOP really are beholden to Rush. The GOP had better learn something fast: The Obama operation isn't just a smooth political operation run by a charismatic showman up front. These are smart, tactical people. They patiently played this Limbaugh card for more than a month. And the bet seems to be paying off big time right now. Robert A. George is a New York writer. He blogs at Ragged Thots.